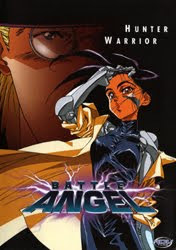 The Anime Archivist: Video Backlog: "Battle Angel (Gunnm)"
Story Outline: In another time, perhaps on another planet a pristine and white city called Zalem hangs in the sky. Down below is the Scrap Iron City and the "Factory" that supplies the floating city with everything it needs. The ground is like a dump for the Zalem, and Scrap Iron City is a dirty, rundown, lawless and poverty stricken place. Ido, a cyber doctor, trawls through the dumped cyborg parts from Zalem looking for usable pieces. He happens upon a head and torso of a female cyborg, and upon discovering she is still alive takes her back to his surgery to rebuild her. Ido names her Gally. Unfortunately for Gally she can't remember a thing about her past, but she seems happy enough living with Ido in the town. Due to the lawlessness of the town, crimes such as spinal column theft and even mutants who eat brains have become common. Gally notices that Ido frequently head out at night, and sometimes comes back with unexplained injuries. Gally is suspects he may be a spinal column thief, and follows him the next night. She discovers that he is a Hunter-Warrior, a kind of Bounty Hunter. Ido is overpowered by one of the mutants, but Gally reacts angrily and with great force kills and defeats both of the mutants. Ido is surprised at her strength. Gally is invigorated by the fight and tells Ido that she wants to become a Hunter-Warrior. Ido initially doesn't want her to take up a dangerous profession, but later accepts it as and makes her his partner after she becomes a licensed Hunter-Warrior. One of the brain eating cyborg-mutants that Gally and Ido have previously defeated, Grewecia, has been rebuilt and challenges Gally to a fight to the death. Grewecia, a former wrestler, has been rebuilt by Chiren, Ido's former cyber-doctor partner from the days when both of them lived in Zalem, before they were expelled for unknown reasons. Chiren hates being in the town and wants to return to Zalem with Ido, except he would prefer to stay in Scrap Iron City and help the locals survive. Chiren develops a hatred against him. Meanwhile Gally has to contend with the discovery of her friend Yugo's illegal second job, spinal column theft. He is desperately trying to escape the hell hole that is Scrap Iron City, and he thinks that he can buy his way there by paying a local criminal, Vector. Unfortunately Gally may be forced to arrest her best friend or even kill him. Mini Review: I really miss the OVA format. It was such a great format to show off short works that really didn’t have the legs for TV series length shows, or were a bit of a financial risk for cinema outings, or too violent for TV. Here is a prime example of what the format could do when funded properly and coupled with a great story. I'm probably speaking to the converted here as I reckon nearly every anime fan has seen it and has some sort of opinion on this show. What I really like about it is the underlying theme of "the rich get richer and the poor get poorer". To me it reminds me of how First World countries treat Third World countries. I'm not too sure if that's what Yukito Kishiro, the writer of the manga, had in mind though. Judging by his other manga "Ashen Victor", and the manga version of "Battle Angel Atlita", it was just bone crushing violence, but I'll have read a bit more of his work before I make a final judgement. Rin Taro (Metropolis, "X") and Nobuteru Yuki (Record of Lodoss War) were involved in the production (supervisor and character designer respectively). With those two, you can't lose. Fantastic little show. So glad ADV re-released it, as James Cameron’s live action version ain’t coming for a while. 8.5 out of 10.